« Nothing Like A Fall Morning! Mid 80s again today and uppers 80s forecast for tomorrow. Slight possibility of rain Tuesday with upper 60s (that would be nice), but back into the 70s then 80s Thursday. 80s through the weekend and maybe low to mid 70s for the early part of the following week. I’m ready for some cooler temperatures! No generation the past two mornings. That is also the projection for tomorrow morning. Nothing until around 1:00 p.m. when it will be a low two units then up to three. Who knows what the week will bring, but I would guess at least a low flow in the mornings with increases in the early afternoon. We’ll see…. Saw lots of dead fish in the water yesterday. Back to my reminder. PLEASE take time to make certain your fish is fully revived before you release it. Don’t play it any longer than you have to and GET IT BACK INTO THE WATER as quickly as you can after bringing it in. Best of all, don’t take it out of the water if you can help it. These fish will continue to be stressed until the lake turns and we get some oxygen back into the lower levels of Table Rock Lake. ruby 2 and a pink lady egg pattern. Gina was out that day with Donna and Rock from Illinois. 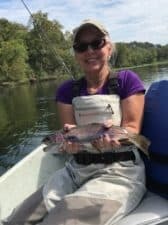 Donna is getting started fishing and wanted to work on casting and technique as this was her first time to land a trout on a fly rod. Rick is taking her to Montana in May and she wants to be ready. They were catching on the ruby 2 under the big ruby, mainly in the area above the boat ramp. It was one of those low generation mornings, so they stayed in the upper area. Wednesday, Carolyn took Howard and Richard out for half a day. It was one of those tough days and the guys pulled a few fish on the ruby 2 and stripping a scuplin pattern. These good fly fishers worked hard for what few fish they got. Larry just finished our 2-day Orvis school and wanted to hone his skills, so he took half a day trip with Stan. Slow day, but the most fish he has ever caught at one time. Ruby 2 under the big ruby and they floated the full run. Donna still working on her skills so she and Rick spent another half a day on the water Thursday. This time it was with Carolyn. 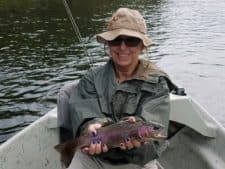 Although this time Rick caught the most fish, Donna pulled the largest fish stripping a holographic green crackleback on a sinking leader. We turned her into a stripper! Think she is ready for Montana. Cindy and Craig fished with Stan most of the day. Ruby 2 and P&P were their best patterns. Bite was a little slow so they went through on their trip. Friday, Stan took Patty and Kevin out for half a day. These fairly new fly fishers had one of the better days on the water, and it was the ruby 2 all day. Water was on when they put in, but turned off at 9:00 a.m., so Stan kept them in the area above the boat ramp. 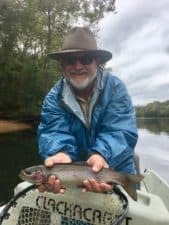 This entry was posted on Sunday, October 8th, 2017 at 2:25 pm	and is filed under Fishing Reports. You can follow any responses to this entry through the RSS 2.0 feed. You can leave a response, or trackback from your own site.